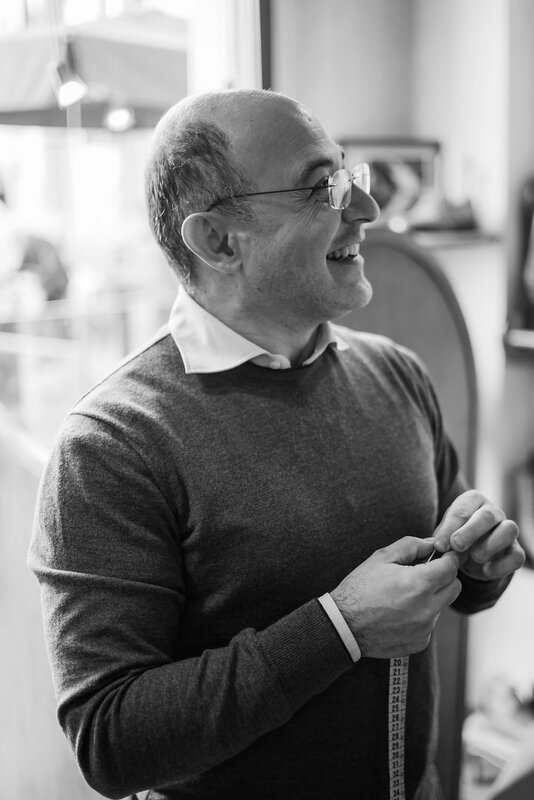 D’Avino is a small Neapolitan outfit run by cutter Fiorenzo Auricchio (above). He has no website, an abandoned blog, and little used social media. Email is the best contact option. D’Avino. Every piece of handwork you could ask for, to the highest level. Much of it purely aesthetic, with no practical advantage, but a work of art. Starts at €300. Luca Avitabile. My most commonly used maker. Visiting every month or two; introduced here on Permanent Style and now with a big London client base. Only the practical handwork, and not finished to the same level as D’Avino, but still good. Starts at €220. Simone Abbarchi. Too early to write about him and recommend him fully, but great value for money for Italian bespoke shirts with no handwork. Based in Florence, comes to London and New York twice a year each. Starts at €120. Value for money. Better make than any English shirtmaker (in that there is no handwork, which I find a practical benefit in), and a lot better than the bigger Italian brands with shops in London, eg Kiton. Style. 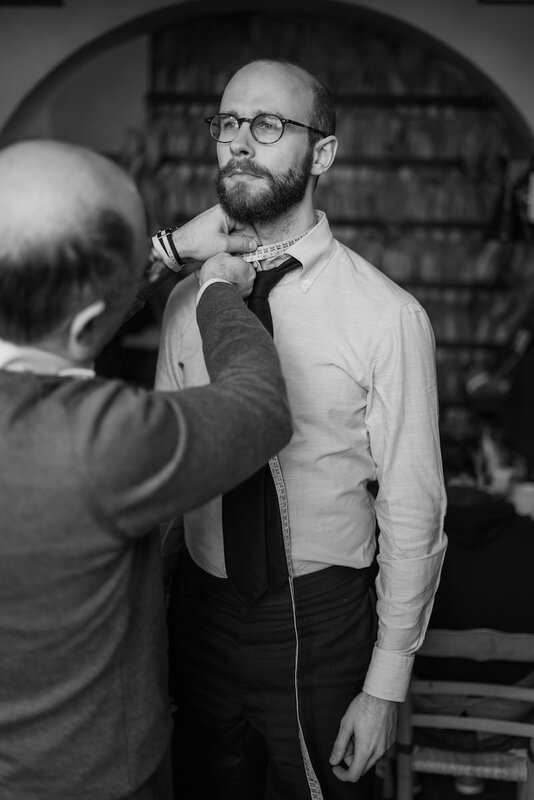 Italian bespoke shirtmakers are particularly good at collar shapes (and the collarband shape – just as important). As I’ve found to my cost with several British and other shirtmakers, there is little attention paid to style in this sense and it is particularly wanting on open-necked shirts. Fiorenzo, as I say, is the best. Here I am being remeasured to check a couple of things, in the Ugolini workshop in Florence. Shirts, perhaps even more than suits, are an evolution of taste and fit. I say more than suits because you are unlikely to have many variations of shirt style, while you might have lots of different suits/jackets. Two collar shapes normally suffice (eg spread and button-down), with perhaps two different cuff styles. 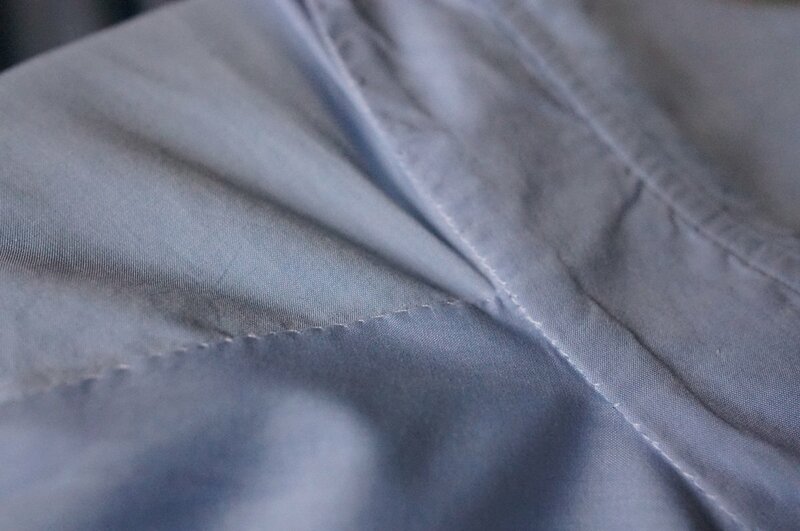 Working with a shirtmaker, then, is about perfecting the body shape, button position, and those few style permutations. 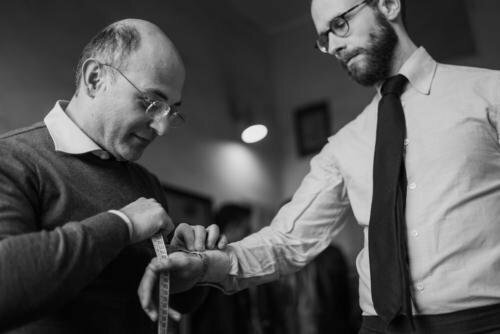 Here, with Fiorenzo, we are increasing the height of the collar slightly and raising the third button, to match that of my Avitabile shirts. 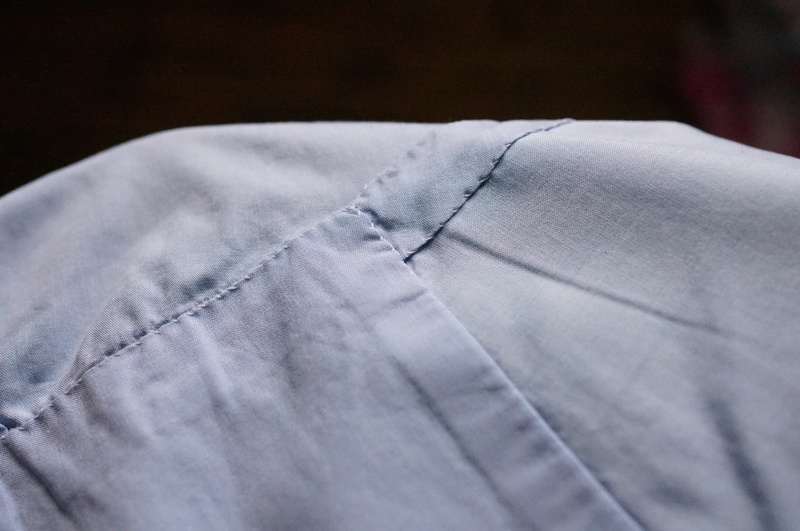 I’ve included a few more shots of Fiorenzo’s latest shirt for me here, to illustrate the fine detail and quality, which you don’t always get with Italian makers. You can follow the discussion on D’Avino shirts – the zenith of visiting Italians by entering your email address in the box below. You will then receive an email every time a new comment is added. These will also contain a link to a page where you can stop the alerts, and remove all of your related data from the site. Thanks for the detail shots Simon, it gives a visual aspect to the quality of the handcrafting. I have great admiration for such skills that are all too rare now. Particularly admire the cuff fit on the wrist (as shown above), out of interest how do you accommodate variance in fit on the watch wearing arm to allow for different watches (slim work wear, chunky weekend etc. .). Could you also make a comment about the cloths used; are they Italian and what is your impression of quality – I know cotton shirting is ubiquitous but the Italians often have access to quality cloths that we do not see here. Also how does D’Avino approach his cutting in consideration of the variance in cloth…for example if a cloth is lighter with more give is he then able to cut it a little closer than he would with a fuller more rigid cloth (denim for example). Just trying to understand his approach to shape and movement when he designs and constructs the garment. I vary cuffs with formality, so casual shirts have slightly bigger cuffs for slightly bigger watches. Italians sometimes use more cloth companies than the English, yes, but they don’t vary that much between each other. Thanks for posting so much valuable information about these great makers. I have a question about fabrics, though. I love the Neapolitan collar shapes, but, also love the tremendous color choices available at Charvet. What do I do? Do I ask Charvet to copy the Italian collar, or would that be an insult to Mr. Colban? Do I bring fabrics to the Neapolitan shirt maker, or would that, too, be a tremendous insult? I ask only because I’ve seen many fabric swatches in the Italian shops, and they’re usually some version of white/striped/pale blue, etc., and I’d like something a bit more complementary to my skin color, yet classic and appropriate. Any suggestions? Also, do you remember the name of the Milanese shirting store mentioned in Alan Flusser’s “Style & The Man”? There is a tremendous selection of unusual fabric at Charvet, but unless what you want is extremely specific, chances are the Italians will be able to find something. Or bring them cloth. Harder to copy a collar. Summer can’t come fast enough this year! Simon….I notice most of your shirts are cut in lighter materials, would you recommend any materials such flannel/wool/moleskin and if so is it practical to wear these thicker fabrics tucked into trousers/jeans or are they better placed for overshirts, likely to be worn untucked? What is his price compared to Luca? what are in your opinion formal trousers fabrics suited for the summer? Probably fresco and tropical wool? Cotton and linen probably too informal. I was looking for something versatile like flannel ( in winter) which can be worn with jackets, but also with sweaters,cardigans. I don’t think there is something as versatile for the summer. so you say tropical wool trousers? To be honest I’m not very familiar with these trousers, do they have somekind of texture? I don’t want them to look like they are suit trousers. No, specifically fresco as they have more texture. But do try heavy linen as well. Is there any particular guidance on mixing fabrics? EG if its a light linen jacket go for fresco rather than a heavy linen trouser? Absolutely beautiful details! With current USD -> EUR exchange rates his prices are almost starting to look affordable. Don’t suppose he does US visits? Also, really looking forward to a full review of Simone Abbarchi. Any other readers have experience of him? Out or curiosity, how did it come about that you were getting fitted by a Neapolitan shirt maker in a florentine shoemaker’s workshop? Simon, Is there bad blood between you and the dire tom stubbs? Another diss of PS on his lacklustre blog today. He has also made derogatory comments about a suitable wardrobe in the past. Complete cheek from stubbs, especially as he looks a state, can’t dress, and dresses dermot o’leary. What’s going on? Not sure there’s any offence intended by Tom Stubbs’ comments. As far as I can see, his mention of PS implies that this is a very popular blog. Tom-speak is difficult to decipher most of the time anyway! He’s ok is Tom. Back on topic, not mad on the soft look of these collars myself. So much handwork, though. How does he make any money!!? Considering the longtime success of English shirtmakers, I’ve never heard of any lack of adventure myself. I had a long discussion with my shirtmaker about the height, length and shape of my collar. He even made a version in card for me to try around my neck. I find English collars clean, formal and elegant. Sorry to hear that you’re own experiences were disappointing. However, D’Avino seems to be the right man for you. I agree (at least on the first point). I’ve had many a tipsy discussion with Tom that has sounded very much like that. Hi Simon, I am a follower who comes to you via Facebook. Because you aren’t listing your posts on Facebook any longer the last one I’ve seen is ‘How many tailors do you need?’ posted 23rd February. Is this a permanent change that you won’t be posing on Facebook any longer? D’Avino, yes. Abbarchi I don’t have a final shirt from yet. do you think trousers have the same risk of jackets of looking “orphaned”? A pair of navy trousers, or worsted pinstripe might look like orphaned suit trousers, but what about grey trousers? Hi Simon, please can you elaborate a bit about perfecting button position? I have purchased a few shirts from Luca Avitabile already but never paid any attention to this. Could you comment on your exact regiment for cleaning your Neapolitan shirts. Do you wash them at home in washer bags and iron them yourself? When you travel and cannot carry enough for the entire trip – what your process for cleaning them? As always, thank you for an informative post. Hi Simon, thanks so much for your wonderful wonderful tips, I was wondering what you think of D’Avino vs. Charvet and perhaps Alexander Kabbaz in NYC in terms of fit, construction, and handiwork? Thanks for this article. Very interesting. Would you be kind enough to find out and post when/where Fiorenzo will next be travelling to London? On a separate matter – what is commication with him like? I often find with visiting tailors that you communicate something, receive the nod assuming understanding, only to later realise that things are not what one expected on receipt of the item. Must add that I’ve never been truly disappointed, just a little frustrated. Sure. Best to contact him directly at that email address too though. It’s not too bad with Fiorenzo, but his English is not the best of the visiting tailors. Though he’s not the worst either. how many fittings are they doing for the shirts. Du you know when they will be next time in the UK? Hi Simon, so for two fittings, that means at least two trips to Naples, and perhaps three if you also need to visit for being measured? I know D’Avino occasionally visits London but that’s quite a commitment, no? Is there any way to make things easier (e.g. by sending measurements by email – that’s how Mary Frittolini used to work)? But there are lots of tailors and shirtmakers that visit London regularly now. If you want the ‘zenith’ of making, do wait for D’Avino. The advantage of shirtmaking is that after the first shirt you will only need one fitting, even none if you are in a rush. Who is the best shirt maker in your opinion? How long does the bespoke process take with Davino? D’Avino so far for me. Process can take just a couple of months if you can see him – biggest issue is he doesn’t travel much. Just starting to the UK. I’ve been an avid reader of this site for a couple of years now but haven’t commented before. I’m a couple of years into a job now (in law) and am about to take the plunge into bespoke tailoring. 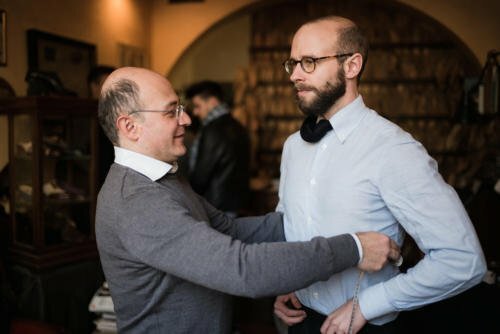 I have an appointment with Luca Avitabile in a couple of weeks with a view to having one (business) shirt made with the potential for more in the future. I was wondering if you have any tips for the appointment itself: what to wear, what to bring, anything specific to ask for or bear in mind given I wish to wear it with a tie or a suit etc.? Any advice at all would be much appreciated. Thanks for all your advice and great articles over the years. I haven’t, though I know a little about her work. I think you’ve said that he has ‘started’ to visit London. Do you know how often he comes over? Thanks again Simon. I have emailed, and he has replied very promptly. No indication of the next London visit, however! Perhaps a trip to Naples is in order. Apologies for posting again on a article that has been published by yourself some time ago. I was wondering if you could shed some light on whether D’Avino and Avino Laboratorio Napolitano are one of the same thing or two entirely separate ‘outfits’ (sorry about the pun). Your view would be appreciated, particularly if you have experience of the latter? Simon, thanks for the posting! On a very pedantic note, what is your stance on fly fronts? I noticed you had a D’Avino shirt with one, but am under the impression it is not your standard. Cheers! Simon, I have heard that hand-rolled bottom seams are a pain to iron. Has that been your experience? Or is there a trick to it? I haven’t had personal experience with them so far. I would love to try his linen shirts. What is the email? Simon – great post, very informative as always. I’m considering bespoke shirts from Guy Field in London. Prices seem reasonable and are inline with Luca and Simone. If anyone has experience using them, I would very much appreciate if you could share. I understand his shirts are made in Italy and has features similar to those from Italian shirt makers. I think having the convenience of someone close by will facilitate getting to a perfect fit quicker vs. travelling tailors. Having said that I’m also planning to have shirts made by Luca and Simone to compare (although it’ll be a little while when they visit London again). Happy to hear your thoughts. Does D’Avino do NY trunk shows? Could you explain how a shirt’s collar should fit in regard to height? Interesting question, perhaps one for a full post. Do you mean how long or wide the collar should be in proportion to your height, or more how high the collar should be up your neck? You mentioned these shirt makers are better than Kiton, is that based on value for money, or more so quality of the garment and tailoring? I bought from a few tailors however none of those mentions. Kiton in my opinion offers a better shirt fabric, and they’re 50% off at the factory in Napoli. Plus you leave the store with a handmade shirt versus waiting for weeks on end. Thoughts? I’m getting my first shirt made by Simone Abbarchi in February, I’m looking forward to it. It’s been a long time since I’ve had anything made and I’m going bespoke, not made to measure. The fitting is going to be by FaceTime when he sends me the first make up so should be interesting. 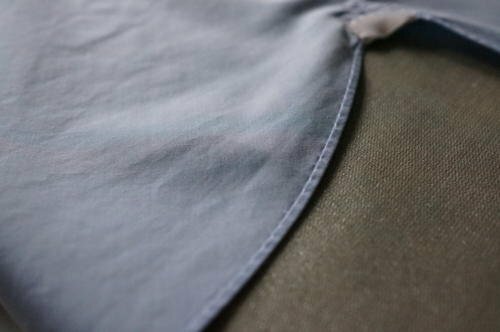 I’ve also got some lovely blue cotton from Alumo that is probably 15 years old so will ask if he can make a second shirt with that. Do you know much about the shirtmaker Battistoni? They told me their shirts are around 450 euros.